As if our incredibly durable, low maintenance teak garden benches weren’t convenient enough, we have taken their appeal to the next level. These fantastic garden storage benches are not only luxuriously designed, highly durable and thankfully low maintenance, they also provide a safe place to store your loose items when not in use. 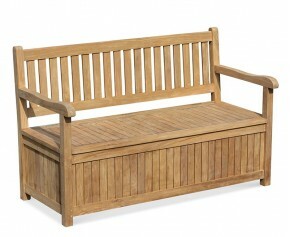 Take your garden from cluttered to clear with our wonderful range of garden storage benches.. Perfect for storing your garden supplies and accessories, this teak outdoor storage bench also doubles up as a garden seat providing an ample seating solution for you and your guests during summer barbeques and gatherings. Comfortably seating 3 adults, this durable teak garden storage bench with arms is perfect for keeping your gardening equipment out of sight and also doubles as a garden bench offering an ample seating solution. Offering the ultimate in beauty and style this luxurious Teak garden arbour bench also known as a garden arbour seat, is the ideal addition to any outdoor setting and provides a graceful focal point that is sure to impress. We understand that you have your own specific needs and tastes, so if our range of stunning teak storage benches doesn’t contain your perfect outdoor seat, no problem! Simply let us know using the “product customisation” option for any alterations needed. 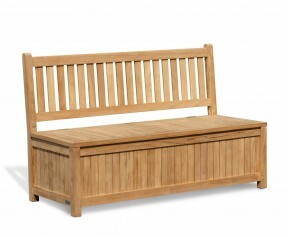 Whatever your requirements you can be sure to build your ideal garden storage bench with us. For beautifully designed, lifelong garden furniture, shop with Corido. Who knew you could make our stunning teak garden benches more practical than they already are? But, we’ve managed it. Whilst offering plentiful seating for you and your guests in the utmost levels of comfort and style, these benches also provide a safe and secure space to store your loose belongings when not in use. Whether it be the hedge trimmers or the grandkids’ football, you can take your garden from messy to immaculate with our incredible range of teak garden storage benches. From the classic Windsor to the luxurious Arbour, you’ll find your perfect outdoor storage bench with Corido.